Environmental Protection Agency Administrator Scott Pruitt issued a memo June 26 directing staff to write regulations aimed at limiting the agency’s ability to block development projects that impact wetlands. 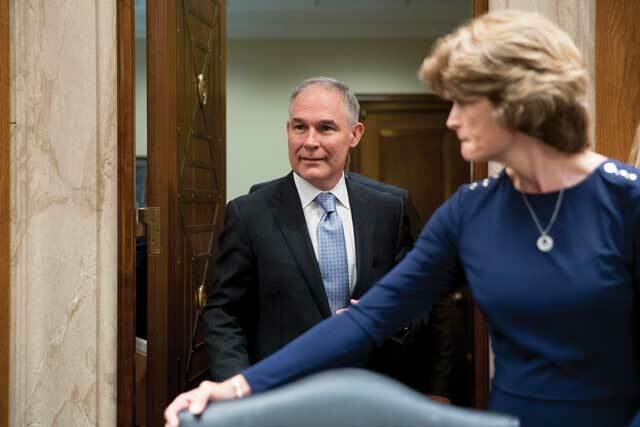 Pruitt’s goal is to stop the agency from using its historically broad authority to overrule U.S. Army Corps of Engineers decisions regarding Clean Water Act Section 404 wetlands fill permits before a permit application is filed or after a permit is issued and a project is underway. The Corps of Engineers reviews wetlands fill permit applications on behalf of the EPA, but the Clean Water Act gives the EPA the power to overrule a Corps decision if agency officials determine a project would have unacceptable impacts on wetlands areas or other water bodies, which Pruitt cited in the document. The decision has nationwide consequences, but Pruitt noted in the memo that the move largely stems from the EPA’s actions under the Obama administration’s attempt in 2014 to block the hotly contested Pebble mine project in the Bristol Bay region before the Pebble Partnership had applied for its Section 404 permit. Pebble submitted its 404 application to the Corps last December, which triggered an environmental impact statement review given the large scope of the proposed mine and ancillary facilities. “Today’s memo refocuses EPA on its core mission of protecting public health and the environment in a way that is fair and consistent with due process. We must ensure that EPA exercises its authority under the Clean Water Act in a careful, predictable, and prudent manner,” Pruitt said in an EPA release. The four-page edict, specifically directed at the agency’s Office of Water, further requires regional administrators to ask EPA headquarters officials for permission to initiate an action to restrict a development at the end of the environmental review process. Pruitt wrote that he wants the regulations drafted within six months. The EPA has not often invoked its Section 404(c) authority — using it 13 times since the Clean Water Act was passed in 1972. However, Pruitt notes in the memo that regulations guiding how the agency implements its 404(c) power haven’t been updated since 1979 and a “long-overdue” update will provide certainty to landowners, businesses and investors hoping to advance development projects. “I am concerned that the mere potential of the EPA’s use of its Section 404(c) authority before or after the permitting process could influence investment decisions and chill economic growth by short-circuiting the permitting process,” he wrote. The possibility of EPA using its 404(c) veto authority was behind a 2010 decision by the Corps to initially deny ConocoPhillips a permit to build a bridge over the Colville River to reach its CD-5 development; the EPA favored an underground pipeline and no bridge. ConocoPhillips appealed that Corps decision and it was reversed to allow construction of the bridge to begin in 2013, which prompted a lawsuit by environmental groups and a few villagers from nearby Nuiqsut. The Corps decision to allow the bridge was ultimately upheld and CD-5 has been producing since 2015. Pebble sued the EPA twice in 2014, first contending the agency overstepped its authority by moving towards, but not finishing, a Section 404(c) veto before the company had applied for its permits. That suit was thrown out by federal Alaska District Court Judge H. Russel Holland because the action had not been finalized and therefore the issue was not ripe for adjudication. Another suit argued the agency had colluded with anti-mine activists in reaching what Pebble claims was a predetermined conclusion that the mine would be an irresponsible development amongst salmon habitat. Holland issued an injunction in that case, halting the EPA from further steps to preemptively stop Pebble, and that suit was ultimately settled out of court in May 2017. The settlement allowed Pebble to apply for its 404 permit with parameters on when the EPA could revisit a Pebble veto in the future. Pruitt’s push to end preemptive and retroactive 404(c) actions is seemingly at odds with his January decision to stop short of withdrawing the Obama-era proposed restrictions on Pebble. The aforementioned EPA-Pebble settlement called for the agency to start the process of withdrawing the proposed mining restriction, but did not require it to be finalized. An agency statement at the time said the EPA has “serious concerns” about the impacts of mining activity in the Bristol Bay watershed and public comments in stakeholder meetings stressed the importance of the world’s largest wild salmon fishery. Additionally, Pruitt said his decision would not derail Pebble’s ongoing permit review. However, he wrote in the June 26 memo that the Corps can process permit applications and conduct an EIS while a 404(c) action is ongoing, but the Corps cannot issue a permit with an outstanding 404(c) proposal. A spokeswoman for the EPA’s headquarters office did not respond to emailed questions in time for this story. Conservation and Bristol Bay-area fishing and Native groups commended Pruitt in January but hammered his latest memo. On May 3, 18 members of the Republican-heavy Congressional Western Caucus and resource development advocates sent a letter to Pruitt urging him to lift the proposed restrictions on Pebble. The letter noted Pruitt’s history as an advocate for economic and resource development, but asked “that the proposed (veto) determination be withdrawn, as was originally planned.” It also contends that the decision is at odds with the administration’s position of making mineral development a top priority. Rep. Don Young, a member of the Western Caucus leadership group and a critic of the EPA’s attempt to stop Pebble before the permits were applied for, did not sign the letter.